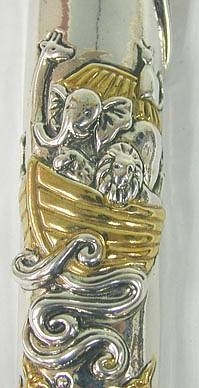 An impressive highly detailed sterling silver parcel gilt Noah´s Ark mezuzah case. 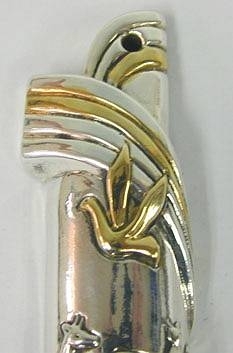 On upper part of the mezuzah are 4 lines and another 3,in each, one line 24K gold plated, forming a rainbow which has in its midst a beautiful 24K gold plated dove shaped as the Hebrew letter Shin which stands for Shadai (Almighty) and Shomer Daltot Israel (The guardian of the Israeli doors) - one of God´s names. The dove is a famous symbol of peace in the Jewish tradition. Below the rainbow is a 24k gold plated ark with Noah´s animals in it; A giraffe, an elephant, a lion, an ostrich, a ship and a cat sailing on the waves of the ocean with 2 opposing 24K gilded fish in the water. 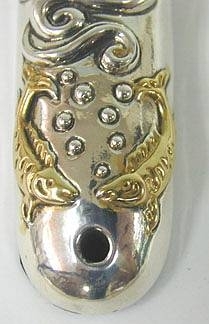 This mezuzah was made in the electroforming method.